Over the years we’ve been involved in a number of displays for the Powerhouse Museum but probably none as shiny as these miniature Big Red Cars in commemoration of 20 years of The Wiggles. The exhibition, running from Sept 2011 until 2012 consists of a huge variety of installations and activities for children and adults. Our involvement was sizeably small in comparison but we were pretty happy with the shiny result. Moulding just under a dozen little red cars, the process is more labour intensive than you may think. To glimpse a progression of the different stages, make sure to check the behind-the-scenes images on our Flickr page. These bright red beauties fit delicately into the palm of your hand. The thick coat of polyurethane paint is nothing more than a safe guard against the unforgiving strength of kids under 5. We took the project from concept to production. Starting with an image of the real Big Red Car (above), we measured and computer modelled until it looked just right. Having a CAD model meant we could tweak the dimensions to suit the particular requirements of the display – ours being a more streamlined version. The car was then 3D printed, hand finished and prepped for moulding. 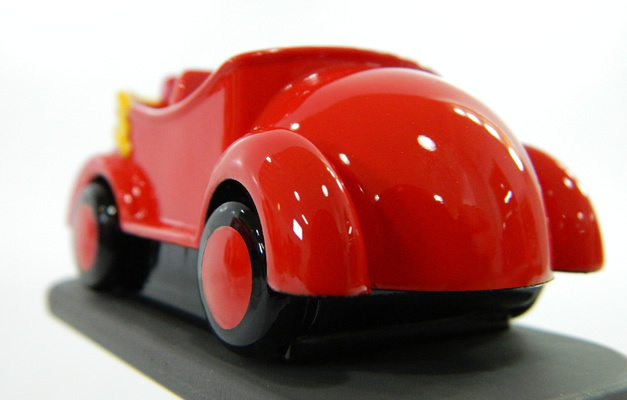 We used a single cavity silicone tool and produced multiple iterations of the car in rigid polyurethane with the runner being over-moulded for stability.